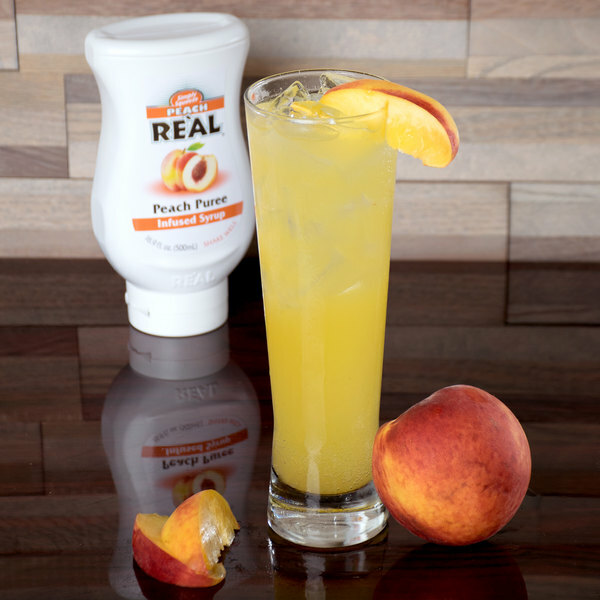 Create refreshing mixed drinks with exciting new flavors using this Peach Real puree infused syrup! Made with 100% cane sugar and peach puree, this premium syrup is naturally-delicious. It dissolves easily in a large variety of beverage applications. Use it for signature drinks at your bar or beverage service, including bellinis, Italian sodas, beer cocktails, alcohol-free drinks, and frozen or shaken daiquiris. Smooth and luscious with a high flavor impact, it's also great for specialty drinks at your cafe or sweet smoothies at your coffee shop! This peach infused syrup is packaged in an easy-to-use squeeze bottle that maximizes handling and dispensing. This bottle's wide mouth opening helps to eliminate waste, since you can scrape out any remaining syrup with a spoon or spatula and use up every last drop. 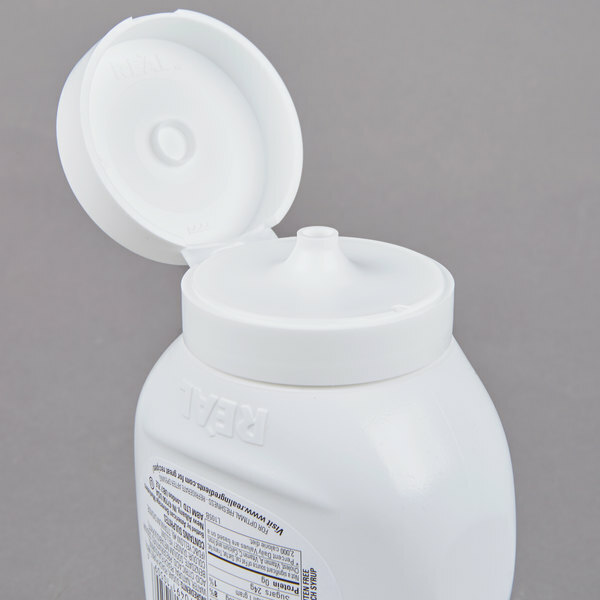 The spout is designed to dispense syrup drip-free with no mess. Infuse this peach syrup into your most popular drinks, and mix up new recipes with a one-of-a-kind taste. Thanks to its bartender-friendly packaging, there are no messy cans and there is no trouble storing unused portions. The squeeze bottle will also enhance shelf presence at your venue and guarantee a smooth pour from beginning to end. This is a nice tasting peach syrup to have around. It is made with real peaches and natural peach flavor as well. Throw in a little prosecco and you have a super quick peach bellini! Sooo good! It's not often that you can find a fruit syrup with this high percentage of actual fruit puree in it! The peach syrup tastes great and is so versatile you can use it in milkshakes, cocktails, on ice cream and in buttercream. All of Real Fruit Puree Syrups are amazing! 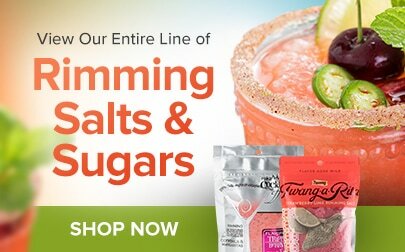 We bought every flavor! 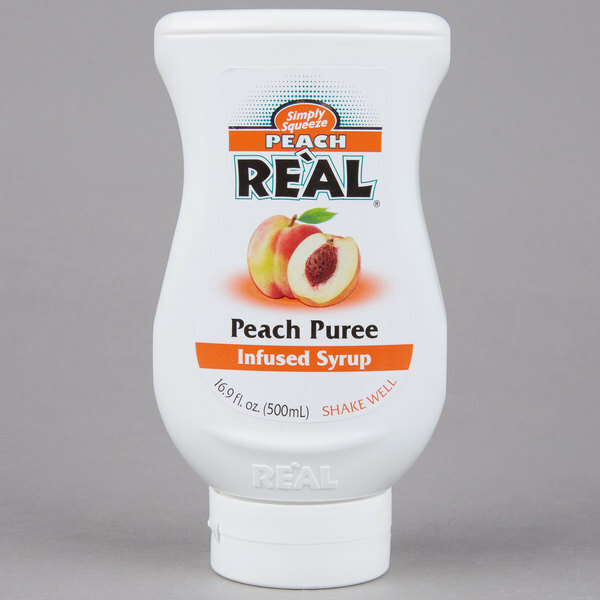 Real peach puree infused syrup is such a fantastic product to have. It really gives your drinks a nice patchy flavor and works really well for flavoring your blended drinks. 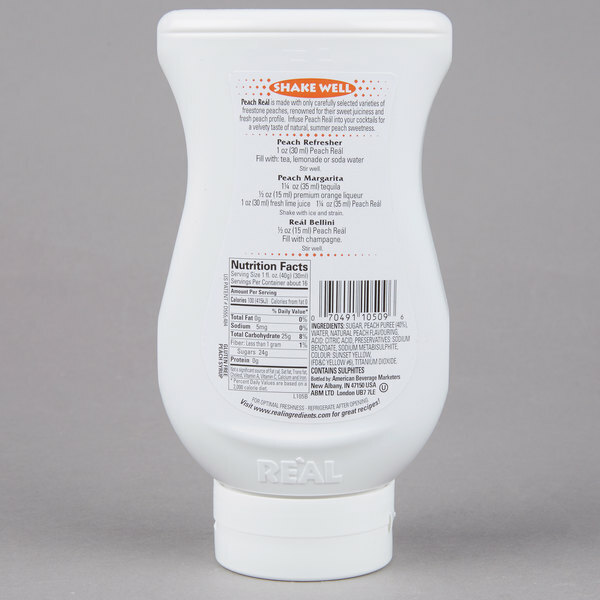 You can not go wrong with any of the fruit purees from Real. So far i have tried the coconut and mango and both were really good. Just picked up the Peach and it is just as fresh and tasty as the rest. this infused fruit syrup tastes like real peaches.we used this to make several desserts and a couple mixed drinks we offer.its great on ice cream too. A great style of peach flavoring that tastes really amazing. It is very fresh and we love flavoring our drinks and cocktails with it. Perfect for peach Bellins. Love the easy squeeze feature of the Real peach syrup and the tastes is unbeatable. A wonderful flavoring for daiquiris or tea alike. So fresh and sweet. Simply Squeeze Peach has great peach flavor. Very similar to the light flavor of pineapple just a little bolder. I prefer to squeeze some into a glass then add a blended frozen concoction to that glass to get the full peachy effect. It is also great added to lemonade and iced tea. We use this syrup all the time. This peach infused syrup is delicious to use when you are making mixed drinks. It has quickly become one of our favorites to use. 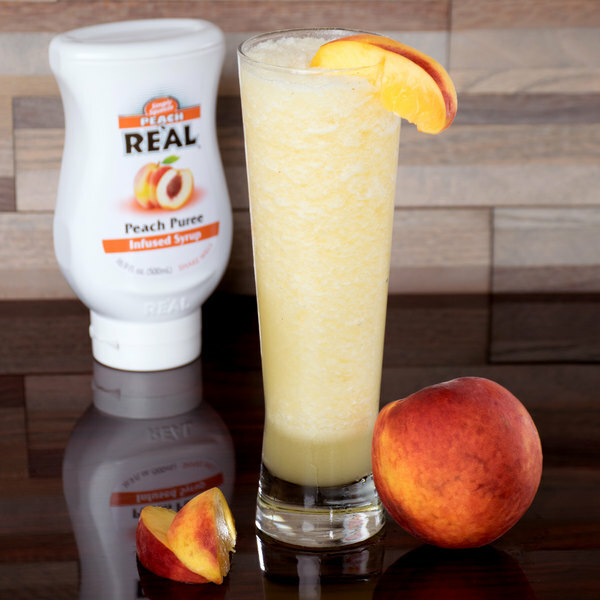 The Peach Real infused syrup is the best way to make a peach mango smoothie. Rich flavor and nice quality. The bottle is great and easy to make sure you have a great flow at all times. The quickest and easiest way to make a great peach milkshake. We squeeze this syrup into our vanilla ice cream and blend for a fresh tasting shake. A great quality product. The peach real is a must buy. The peach flavor is fresh and delicious. We love adding a splash to our tea for a great summertime treat. We purchased this peach infused syrup for making breakfast smoothies. Smooth, sweet and delicious it was certainly a great treat with a incredible price. Your imagination is the only limit. Peach Real 16.9 fl. Oz infused syrup is so good. They are great to add to all of your drinks and the squeeze container that it comes in is very convenient. The peach infused syrup is decadent and delicious. it makes a really great and fresh tasting peach milkshake when blended with vanilla ice cream and milk. The syrup is a great color and smells wonderful.. The REAL Peach has a nice fresh taste that blends well in cold drinks. We add it to ice tea and hot tea instead of keeping flavored teas around. It's an easy way to add flavor to plain black tea in a hurry! The peach syrup is so fresh and delicious. The peach makes a great tasting daiquiri and smoothie. I love the easy to use squeeze bottle. The Peach real syrup is very tasty. It reminds of summertime on my uncles farm in Georgia. The syrup is decadent and makes a really great peach smoothie. This peach syrup is incredible. Super thick is perfect to flavor iced tea, hot tea, pancakes, ice cream, pretty much anything your little heart desires!